The Japanese have a sense of pride at being more diligent than the rest of humanity. But the human body needs rest, even in Japan, “the most sleep-deprived nation”. 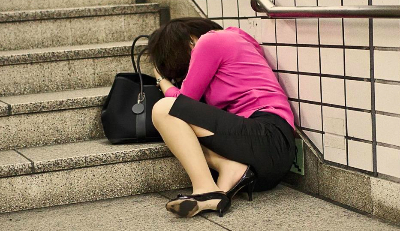 The Japanese seem to be gifted with the unique art of falling asleep almost anywhere - during official meetings, in elevators, on trains. They call this ‘inemuri’. The Japanese also have great tolerance for 'karoshi', death due to overwork. 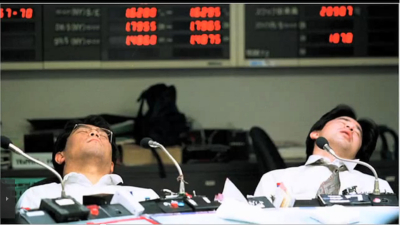 The Japanese are adept at the art of inemuri or the power nap at the workplace. Inemuri is a Japanese word that means, “sleeping while present”. It refers to the practice of sleeping while on the job. 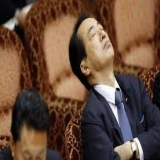 The Japanese may be fall asleep during public functions, meetings, social gatherings and at work without ridicule or reproach from others. 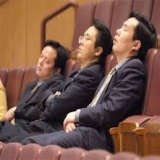 In most countries anybody caught napping at a public event or the workplace may be a source of embarrassment and disdain. Not so in Japan. On the contrary, inemuri is a badge of honour. It indicates you spent the last night working. Interestingly, Japanese workers who are in deep inemuri never seem to go overboard and retain their composure. For instance, a commuter would be well aware of his stop and jump out of his inemuri and the train at his scheduled stop. Inemuri has been practiced in Japan for at least 1,000 years, and it is not restricted to the workplace. People may nap in department stores, cafes, restaurants or even a cozy spot on a busy city sidewalk. Why does it have positive connotations? Rather than indicating any negative connotation, Inemuri shows the Japanese commitment to work, which prevents them from having adequate sleep at home, forcing them to indulge in inemuri. The Japanese are reputed to be a workaholic lot and are always short of getting the stipulated hours of good sleep and rest at night. This cycle continues all through the day making them a terrible sleep-deprived nation. Hence inemuri is not frowned upon at the Japanese workplace. 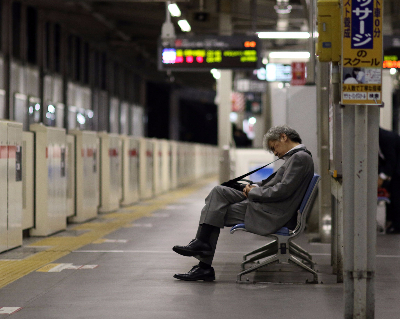 The Japanese people are so overworked they realize the benefit of a powernap. A brief spell of inemuri may recharge the overworked Japanese worker to be more productive at work for some (more) time. Inemuri is not just socially accepted, it is even celebrated. It is a much respected practice in Japanese workplace depicting ones dedication to work. Sleeping in social situations can enhance your reputation. One researcher recalled a group dinner at a restaurant where the male guest of a female colleague fell asleep at the table. The other guests complimented his “gentlemanly behavior” — that he chose to stay present and sleep, rather than excuse himself. 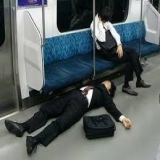 Sleep taboos may exist in the Western countries but in Japan taking an inemuri is considered a prerogative of the hard-working and dedicated lot and the powerful people at times may even fake it. When have people engaged in ‘fake naps’? Some especially cunning managers may pretend to sleep so they can hear what others are saying when they think they are speaking freely. 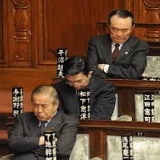 In this case, what appears to be inemuri to the unsuspecting workers is actually ‘tanuki neiri’ — a fake nap. This deceptive practice is also fairly common during the evening commute. Many workers who appear to be in inemuri on their train ride home are actually employing tanuki neiri. They may do this to rest their mind after a brutal workday, or just to avoid gazing at others, which can be seen as rude. Tanuki Neiri or “raccoon dog sleep” is a similar expression to “playing possum” in English. It is said that the firing of a hunter’s gun may cause raccoon dogs to faint and fall out of the trees. Then when the hunter incautiously approaches, the animal suddenly leaps to its feet with rage in classic horror movie style, and makes its escape. We have not verified this at home. 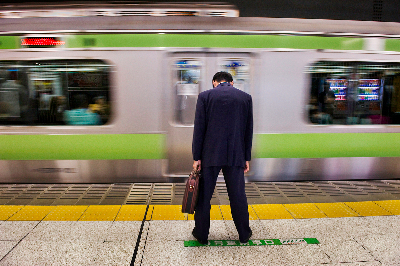 Japan’s government has recently warned that 20% of the entire workforce at risk of death from overwork, or karoshi. Hundreds of deaths related to overwork – from strokes, heart attacks and suicide – are reported every year in Japan, along with a host of serious health problems – symptoms, critics say, of the demands placed on workers who routinely work long hours and take short holidays. It is not that the government requires the people to work so much. In fact, it has been trying hard recently to convince the workers to take time off for holidays (and make babies too in the free time to stop the decline in Japanese population growth). A government white paper on karoshi, published in October 2016, found that despite attempts by some firms to establish a better work-life balance, Japanese workers still spend much longer hours in the office than those in other countries. The paper added that approximately 21.3% of Japanese employees work 49 or more hours each week on average, well above the 16.4% reported in the US, 12.5 % in Britain and 10.4% in France. 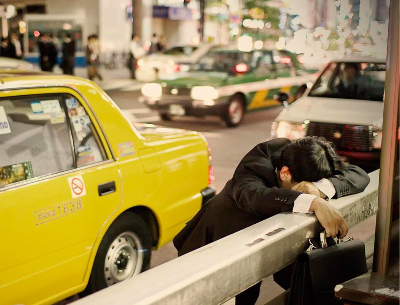 Overwork has become a matter of pride, an attribute on which the Japanese are uncompromising. Firstly, engaging in Inemuri is a question of seniority. If a person is new in the company it isn't a good idea sleeping in the workplace. They are expected to show how actively they are involved for the good of the company. But with seniority come rights in Japan, the longer you have been with the firm the more often you can sleep during working hours. Of course, no one stops you from sleeping outside office. Secondly, when engaging in Inemuri workers can't just pull out their mats and sprawl out under their desk. Neither can they slouch on their office chair. The right posture is paramount when indulging in Inemuri. Because sleeping for the sake of sleeping is not honorable. It should be clear to others that you have fallen asleep despite your best efforts to remain awake. Thus, although you are actually asleep it is important to sit up, tilt your head forward and look engaged. It must appear as if you are concentrating. This demands a ‘seventh sense’ to get up as soon as your presence is demanded. Inemuri is most prevalent among more senior employees in white-collar professions. Junior employees tend to want to stay awake all day and be seen as energetic, and workers on assembly lines can’t just nod off. Both sexes indulge in inemuri, but women are more likely to be criticized for it, especially if they sleep in a position that is considered unbecoming. Who have adopted this concept? Uber: The ride sharing company's San Francisco headquarters includes nap rooms. "For Uber, a company known for regulatory battles, we were tasked with creating a room built for maximum efficiency - a room so built for work that no one would need to leave. This included a living room space, a kitchenette, and, of course, small focus rooms that double as nap rooms," say designers. Google: The perks at Google's Mountain View, California, headquarters are aplenty, nap pods being one of them. Zappos: Perks at the online shoe retailer's Las Vegas headquarters include EnergyPod chairs. Capital One Labs: A World's Coolest Offices 2014 honoree, the software company has a wildly bright interior, meant to nurture the creative spirit among its San Francisco team. It also houses sleeping nooks, which are connected to the ground by way of ladders and support beams. PwC: PricewaterhouseCoopers is another surprising adopter of nap pods. "Most people are told that the harder you work, the longer you work, the better it is, that's not sustainable, and that's probably also not true. It's about smart working, and that means you need to recharge," explains an executive. It must be noted, however, that these power naps are not quite like Inemuri. The Japanese practice requires you to sleep trying to avoid sleep. The above examples are about sleeping in comfort, regardless of whether or not you had a sleepless last night. 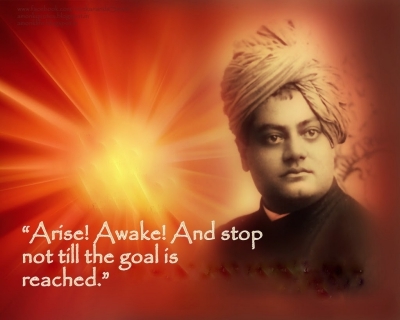 Swami Vivekananda was inspired by the energy of the Japanese youth and wanted his fellow Indians to be as hard-working as them. He became a fan of the spirit of staunch nationalism that pervaded Japan. They could make anything, from a match-stick to a weapon of war, in the best way possible. He was even angry that while the Japanese were hard working, Indians were hardly working. In fact, he was disgusted by the lack of ambition among India’s youth. “And you, what are you [Indian youth] … talking twaddle all your lives, vain talkers, what are you Come, see these people [the Japanese], and then go and hide your faces in shame. A race of dotards, you lose your caste if you come out! Sitting down these hundreds of years with an ever-increasing load of crystallized superstition on your heads, for hundreds of years spending all your energy upon discussing the touchableness of untouchableness of this food or that, with all humanity crushed out of you by the continuous social tyranny of ages – what are you And what are you doing now … promenading the sea-shores with books in your hands – repeating undigested stray bits of European brainwork, and the whole soul bent upon getting a thirty rupee clerkship, or at best becoming a lawyer – the height of young India’s ambition – and every student with a whole brood of hungry children cackling at his heels and asking for bread! Is there not water enough in the sea to drown you, books, gowns, university diplomas, and all "
Vivekananda himself was a tireless preacher, traveller and worker, and often went days without sleep. He believed that a few minutes of true meditation was more powerful than hours of sleep. That was his idea of a power nap. How can napping improve productivity? Dozens of small medical studies have shown that napping for about 30 minutes to an hour in the early afternoon increases a person's productivity, alertness and sometimes even their mood. Providing employees with napping pods or offering extended breaks can improve their productivity by counteracting impulsive behavior and boosting tolerance for frustration. Before electricity, our daily rhythms made us go to bed with the sun. People would sleep for four hours, get up, light a candle, do a couple things around the house and then go back to bed. 24 hour light, due to electricity has changed this. Now the internet is making things worse. Not sleeping through the night can impair workers' attention and memory and contribute to fatigue. From the moment you wake up, your brain produces a chemical called adenosine, which is a neurotransmitter that promotes sleep and suppresses arousal. The longer you are awake, the more adenosine builds up, like steam in a pressure cooker. After about 16 hours of wakefulness, that chemical has built up so much that you have to sleep to release it. If you nap late in the day, you dissipate that pressure, waking up refreshed. In European countries such as Spain and in many Latin American countries, an afternoon siesta is, in fact, considered normal. Even local shops close in the afternoon for a couple of hours, when it's hard to get any business done. In the 1990s, napping actually became rocket science. That's when NASA began examining how naps benefited task performance on missions through increased alertness. NASA found that even naps as short as 26 minutes improved mission task performance by 34% and saw a 16% increase in median reaction time. The data hatched NASA nap culture, adopted by the agency's workers on the ground. Well, this is how the Americans approach their work. 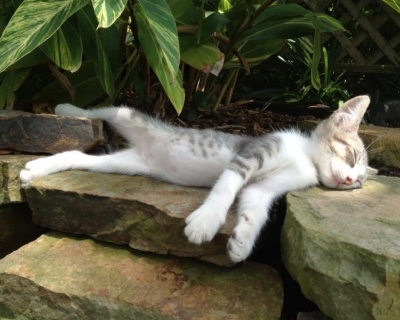 We think it is alright to sleep anywhere at any time as long as we wake up.